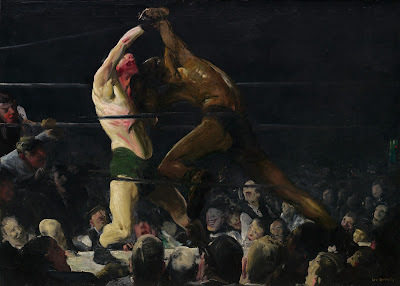 I got sucked into the George Bellows exhibit at the National Gallery of Art. There's something about these paintings that makes you want to stand there and just look at them. And this gritty painting is titled The Lone Tenement, which Bellows painted in New York City, also in 1909. 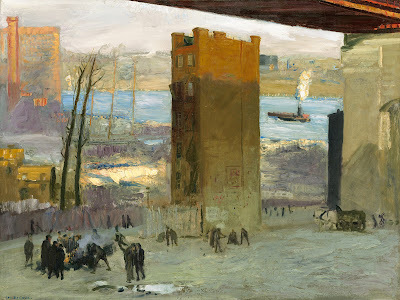 The surrounding buildings had been razed as part of a bridge construction project, except for this one holdout tenement. Bellows made these paintings almost 100 years ago, and he died in 1925, but the themes remain relevant. The first one makes me think about how we're entertained by others' pain -- like reality TV and even football players who develop dementia from concussions. And the second one shows urban displacement in the name of progress. The exhibition runs through Oct. 8 at the National Gallery of Art's west building. It'll be in New York in the winter and London through the spring.